On June 23rd Fulani Herdsmen in the Jos Plateau area attacked numerous villages. Officials report 238 persons killed in 17 villages. The attackers also burnt and vandalized the villages, destroying homes, churches and properties. The people cannot return home. Some reports indicated that roads to outlaying villages are blocked by the Fulani. Many families are displaced and living with relatives or in temporary camps. Ekklesiyar Yan’uwa a Nigeria’s (EYN) main area is in Northeast Nigeria but it has a presence in the Jos Plateau area where the June attacks occurred. The Middle Belt of Nigeria has many Christians from numerous denominations. 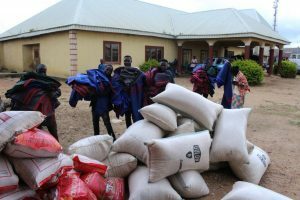 When EYN’s Disaster Response Ministry got word of the numerous displaced persons in Bokkos LGA, they were ready to help. The Disaster team organized a large distribution for 1639 persons in the Bokkos area. 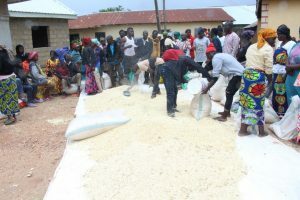 9000 pounds of corn, 7,700 pounds of rice along with beans, gari, palm oil, spices and blankets were distributed. Recipients of the food distribution were so grateful. They noted that EYN’s methods were different than other relief/government agencies; they actually stayed to distribute the materials, gather data and listen to people’s stories. The devastation of these villages will have long reaching consequences for all those involved. The Disaster team is well aware of this because of their work in the Northeast. Despite all the work the Disaster team has going on as they help in the Northeast, they came to the aid of their fellow Nigerians in a time of desperate need . Well Done Nigerian Brethren!